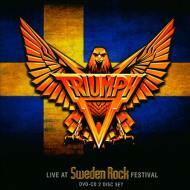 "Live At Sweden Rock Festival"
Canadian power rockers TRIUMPH had a heyday, though you had to have been around to witness it. From the late Seventies through part of the Eighties, TRIUMPH were arena giants staking their reps on pyro, lasers and air-pummeling rawk which headbangers wrangled as part of their cause. Compared far too often to prog lords RUSH by means of mutual heritage and the muscle of three in ranks, TRIUMPH could be intricate when they wanted to be. At the height of their success, however, they embraced a more meat-and-potatoes, working-class-anthem approach making them stalwart rockers of their day. "Allied Forces" today remains one of the most crucial hard rock recordings of the Eighties while "Just a Game", "Rock & Roll Machine" and "Progressions of Power" stand as a proud succession of booming albums well worth your investment. In some respects, TRIUMPH became an in-the-know honorary quasi-metal band that got lost in the ascension of the NWOBHM and later, the hair metal contagion to which TRIUMPH unsuccessfully tried to merge beginning with 1984's "Thunder Seven". Some might argue they began this unsteady courtship an album earlier with the sometimes hefty, sometimes aloof "Never Surrender". Regardless, "Allied Forces" became the hip slab to toss onto the turntables of Gen X North America, the primary fan base TRIUMPH was able to farm out for most of their careers. Two decades after their split-up, TRIUMPH played to a European market they describe in a pre-gig press conference was inadvertently ignored due to label blunders and financial restraints. In 2008, Rik Emmett, Mike Levine and Gil Moore set aside old differences at the Sweden Rock Festival in Solvesborg and re-ignited TRIUMPH for a series of reunification gigs. These might be considered nostalgic in hindsight, given there's been nothing new to surface from the band since the Emmett-less "Edge of Excess" album from 1993. "Live at Sweden Rock Festival", for the most part, is a gnarly onstage retrospective which showcases TRIUMPH's best-known songs, such as "Lay It On the Line" from the "Just a Game" album, the title cuts from "Never Surrender" and "Rock & Roll Machine", "I Live For the Weekend" from "Progressions of Power" and a trio of selections from "Allied Forces" including their calling-card heavy-rock hymn, "Fight the Good Fight". While purists might be chomping to see if TRIUMPH still has the chops to pull off the "New York City Streets" couplet and "The City" epic from "Rock & Roll Machine", you won't get any of that. However strongly those sophisticated compositions make an argument that TRIUMPH and RUSH were kindred for a moment in time, the set for "Live at Sweden Rock Festival" plays generally for harmony's sake and the remembrance of party metal. Arguably, this strategy plays to TRIUMPH's advantages as they began the dust-off effect in 2008 to get onstage again as the original triumvirate, considering Rik Emmett had first sojourned from the group twenty years prior. "Fight the Good Fight" unfortunately comes off as a slight mess with a few timing hiccups and poor Emmett trying to nail high altos that aren't there any longer. No disrespect intended, because he peels the paint with a splendid solo that mostly undoes any transgressions. At least by show's end we've learned the man can still shred, Mike Levine is still a reliable backdoor force of rhythm and Gil Moore still pounds his kit and sings with rowdy composure. Emmett and TRIUMPH are massive throughout their extended version of "Rock and Roll Machine" and "Allied Forces" but the highlight of this live set is, without question, "Blinding Light/Moon Child". Herein lies TRIUMPH's aptitude for dexterity and calculated expressionism. They celebrate long-ago glory of arena rock in sound, even if the pyrotechnics throughout this set are far more restrained than what TRIUMPH used to pelt their audiences with. This CD/DVD combination is naturally more interesting in the video portion. With additional guitarist Dave Dunlop skulking backwards and frontwards as required, TRIUMPH comes off bulkier as a result, even as they shake off the rust in portions of the show. At least the DVD gives us a full glimpse of this transitory reunion before an outdoor crowd that matches up to the cumbersome revelers set before TRIUMPH in concert halls of yesteryear. Their cover of Joe Walsh's "Rocky Mountain Way" was always fun and remains thus in 2008, yet most of TRIUMPH's fans would've favored they pull out "Takes Time", "Just a Game", "Petite Etude", "Say Goodbye" or "Hold On". You can't have everything, but you can kick up "Live at Sweden Rock Festival" and remember how bitchin' TRIUMPH once sounded coming out of your old basement Kenwood.